The University of Maine at Presque Isle announced its intentions to move forward on its biggest green energy project ever – a wind turbine project – in May 2007. The hope was to install a mid-size wind turbine that would meet the campus’s energy needs, significantly reducing energy costs and helping the University to leave a much smaller carbon footprint. 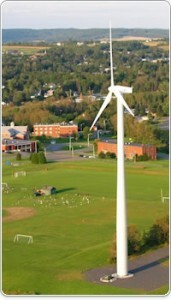 In the Fall of 2008, the University signed a contract with Lumus Construction Inc. to install a 600 kW wind turbine adjacent to its athletics fields at the southern end of campus. The contract established UMPI as the first university in the state and one of only a handful in New England to install a mid-size wind turbine. The turbine is expected to produce about 700,000 kilowatt-hours of electricity per year and save the institution more than $100,000 annually in electricity charges. It also is expected to save an estimated 572 tons of carbon dioxide from being released into the atmosphere each year, or the equivalent of removing 123 cars from the road. The $2 million project included the cost of the turbine and its installation. The turbine tower was manufactured in the U.S., the nacelle and rotor blades in Chennai, India. In late 2008, crews began drilling and excavating to put steel and concrete into the ground to complete the turbine base. In 2009, they began the installation process, placing the 65-meter turbine tower on the base, and then assembling the turbine nacelle and rotor blades and placing them atop the tower. The turbine was completely assembled and generating electricity by late Spring 2009.